From 1903 to 1906, Professor Yoshiaki Yamashita of Tokyo traveled the United States providing instruction in the new martial art of judo. In Washington, D.C., he provided instruction for the sons and daughters of the nation’s political and business elite and was brought to the White House to teach President Theodore Roosevelt. In 1905-1906, Yamashita was employed by the U.S. Naval Academy to train midshipmen, but after his contract ended in the fall 1906, he returned to Japan and continued to teach judo until his death on October 26, 1935. He was posthumously awarded the 10th degree black belt, the first ever so honored. The Yamashita photograph album contains 53 silver developing out prints apparently taken to illustrate various judo throws and holds, along with Yamashita’s calling card and four documents relating to his time teaching judo in Washington. Seeking to strengthen his nine-year old son’s “character,” Samuel Hill, sought out a suitable man to provide instruction in an exotic art he had seen during a business trip to Japan: judo. A wealthy Seattle railroad executive, Hill had the contacts — and funds — to hire the best and in February 1903, Kazuyoshi Shibata, a Yale student and friend of a Japanese acquaintance, recommended Professor Yoshiaki (Yoshigutsu) Yamashita as the best man for the manly job. Having long believed that making judo better known abroad would be good for Japan, Yamashita was an outstanding choice to spread the discipline in America, and he quickly responded to Hill’s inquiry. Accepting the offer in August 1903, Yamashita sailed for Seattle the following month, bringing with him his wife, Fude, and a 19-year old assistant, Saburo Kawaguchi (or Kamaguchi). Barely a week after their arrival, the trio gave a private judo exhibition for Hill and prominent invited guests, which historian Joseph Svinth believes may have been the first Kodokan judo exhibition for a non-Japanese audience in North America. From Seattle, Yamashita and his party traveled across country by rail to Washington, D.C., where Hill’s son, John Nathan Hill, was then living. Offering demonstrations and lessons through the Japanese Legation, Yamashita found an eager audience of students in the nation’s capitol, and a surprisingly strong interest among the daughters of the nation’s political and corporate elite. Among the many who took notice was the President, Theodore Roosevelt, who had a well-known passion for what he considered manly pursuits. Through the Japanese Naval AttachÃ©, Isamu Takeshita, Yamashita was introduced to Roosevelt at the White House in 1904 and by the spring, he had Roosevelt adding judo to his regular fitness regimen. From this point forward, Yamashita’s American sojourn wound down. His contract with the Naval Academy was not renewed for the fall 1905, but after Roosevelt personally intervened, Superintendent James H. Sands agreed to rehire him for another year. At the end of this second term, however, Sands recommended that the judo program be discontinued as not essential to shipboard life. Yamashita returned to Japan in the fall 1906 and continued to teach judo until his death on October 26, 1935. He was posthumously awarded the 10th degree black belt, the first ever so honored. The Yamashita photograph album consists of 53 silver developing out prints of Yamashita’s tour of the United States in 1903-1905. Laid onto stiff cardboard pages in a canvas-bound album, the images appear to have been used as teaching aids or as promotional material for classes taught by Yamashita in Washington, D.C., during the early months of 1904. 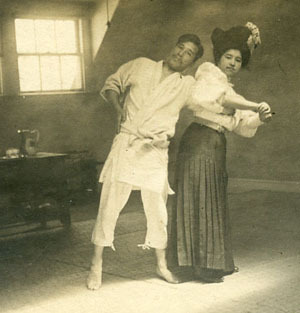 A small number of images show Yamashita, Yamashita’s wife, Saburo Kawaguchi, and their students, but the majority are intended to depict particular judo holds and throws. Laid into the album are four documents: a list of judo exercises (2p. ); Yamashita’s address (“kindness of Lt. [Isamu] Takashita” of the Japanese Legation); a receipt in Japanese and English for payment by George de Geofroy, (presumably for judo lessons); and instructions for various judo throws (6p.). Yamashita’s calling card is included in an envelope laid into the front of the album. Many of the images are numbered in the negative and appear to have been photographed in a rather elaborate setting. Yamashita, Yoshiaki, Address in Washington, D.C.